In peacetime and wartime alike, it is not sufficient to ask “how many died,” but also “who died”. Casualty recording is a systematic process to record all individuals killed in armed violence. In the run-up to the international launch of the Standards for Casualty Recording, to be held at the ICRC in Geneva on November 23rd, Every Casualty Worldwide co-founders Hamit Dardagan and John Sloboda write on how integrating these standards into the discourse and practice will lead to a more professional and widely recognized field – one that is able provide an inclusive and useful picture of human losses. Those of us who value the vital work of the ICRC and other humanitarian agencies are apt to seek progress towards a world where such work becomes unnecessary. We might have hoped that the present era, the most globally connected and information rich, would have escaped the age-old horrors of armed conflict. Sadly war, the “scourge of humanity”, persists in the modern world, as does its core characteristic: violence and violence-related death on a large scale. However the modern age is seeing an increasing number of organizations dedicated to publicly recording these human losses. Such casualty recorders are finding ever more effective, inclusive, and fittingly human ways to document and highlight the lethal impact of war. No one can undo harm to the dead, nor to their families and friends. Yet there are good reasons why casualty recorders undertake such careful documentation work. Casualty recording relieves the anguish of not knowing the fate of loved ones who are missing. It enables more timely, reliable and comprehensive monitoring of armed violence, including its impact on specific groups. It gives a human face to the nameless, hidden, often distant victims of armed violence, and provides essential information for all parties to take every possible step to protect civilians from armed violence. This can help bring States and parties to armed violence into better compliance with the spirit as well as the letter of international humanitarian law, human rights law and refugee law. In the longer-term, detailed casualty records can support post-conflict recovery and reconciliation, which must always be grounded in truth. Global public discourse has failed to keep pace with these growing efforts. 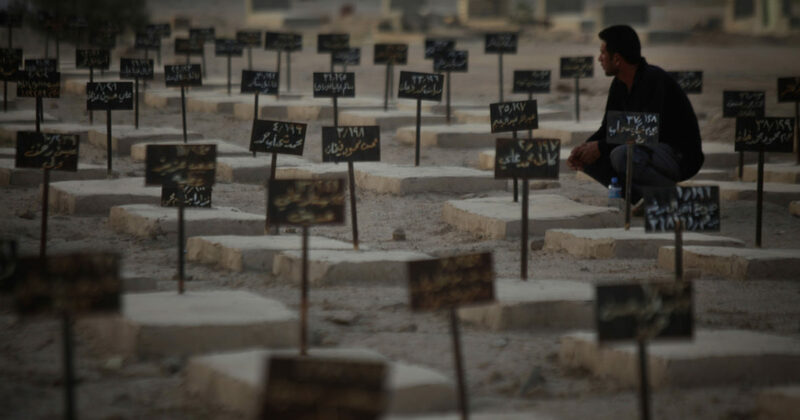 When there are mass atrocities in peacetime, everyone understands that it is not sufficient to ask “how many died” but also “who died”; that we need to acknowledge the deaths as those of individuals, who should be remembered accordingly. Yet when it comes to regions mired in conflict and civil disorder, we all too readily treat the violent deaths that result as statistics, assuming that acknowledgement of the human identities behind these numbers is beyond achievement. Furthermore, we lack the sophistication of discourse that allows nuanced examination of the veracity even of the bare numbers we are presented with. Most people are aware of how rapidly and widely the new information technologies have spread and become a feature of life across the world. Yet there is little awareness that these technologies are now transforming the efforts of casualty recorders. Aided by this technological stimulus, casualty recording is fast becoming a recognized field of research (and social healing) in its own right. This is largely thanks to recent concerted efforts to bring about such change by casualty recording practitioners and those who use their data. The first concrete result of these efforts is a set of jointly produced Standards for Casualty Recording, due to be launched at the ICRC’s Humanitarium on November 23rd 2016. The issuing of these standards reflects a shared desire to counteract some of the prevailing issues, including that the difference between the best and worst practices go unnoticed, because undefined; and that in this fog, the better work is hard to discern and loses impact. Modern practitioners have set the pace in this field – beginning with efforts from the 1990s (for instance for conflicts in the former Yugoslavia, some of whose work still remains unmatched in scope and ambition – one such example being The Kosovo Memory Book). Despite these advances, there is still too little understanding of what casualty recorders do and how it may benefit communities affected by conflict. Accordingly, there remains a strong desire for wider recognition of good practice by those who practice it. One such example consists in better understanding the nuances which must be taken into account when assessing casualty data (for instance between deaths recorded during the heat of conflict, and post-conflict). Standards have proved to be a powerful engine for improved understanding and spread of good practice in a wide range of humanitarian and human rights contexts. Particularly pertinent examples are standards in fields such as International Mine Action Standards and the ICRC’s Professional Standards for Protection Work. The Standards to be launched define ‘casualty recording’ as a systematic process to record all individuals killed in armed violence. Other definitions can be broader, and include for example a record of the injured, or those more indirectly affected by armed violence. The starting (though not necessarily final) concern addressed here is for those most immediate and direct victims whose violent deaths and identities are all too often lost to the public record. The process of casualty recording, thus defined, consists in documenting deaths of individuals and the incidents in which they were killed, including the name and identity of each individual; the date, location, and circumstances of the incidents including the weaponry involved; and, where known, the perpetrators. Not all of these details are consistently available to those carrying out the recording, depending on conditions such as the context and stage of a given conflict. Lack of access to every such detail need not, however, prevent the accumulation of useful (even if necessarily less fine-grained) data, even during intense stages of a conflict. Example of incident page from the www.iraqbodycount.org website. 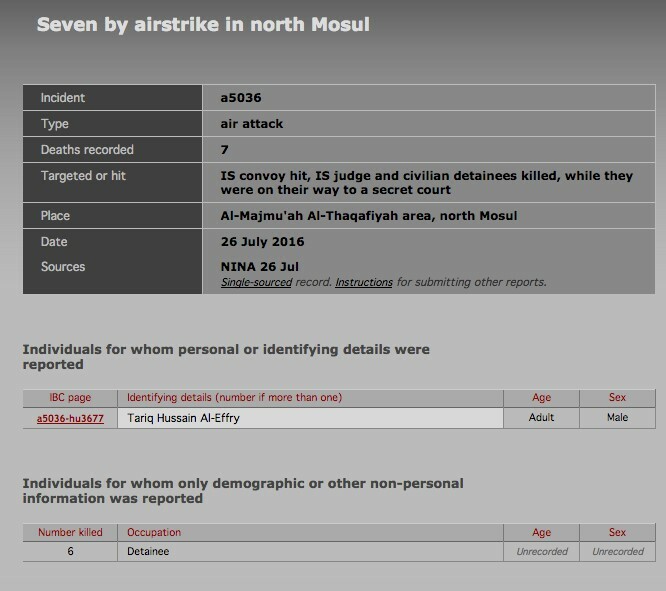 Examples of current casualty recording projects which publish casualty records in this detailed and disaggregated way include the UK-based Iraq Body Count project, which records civilian casualties from the ongoing conflict in Iraq, and the Israeli Information Center for Human Rights in the Occupied Territories (B’Tselem), which records, among other things, all individuals killed in the ongoing conflict in the Occupied Territories. 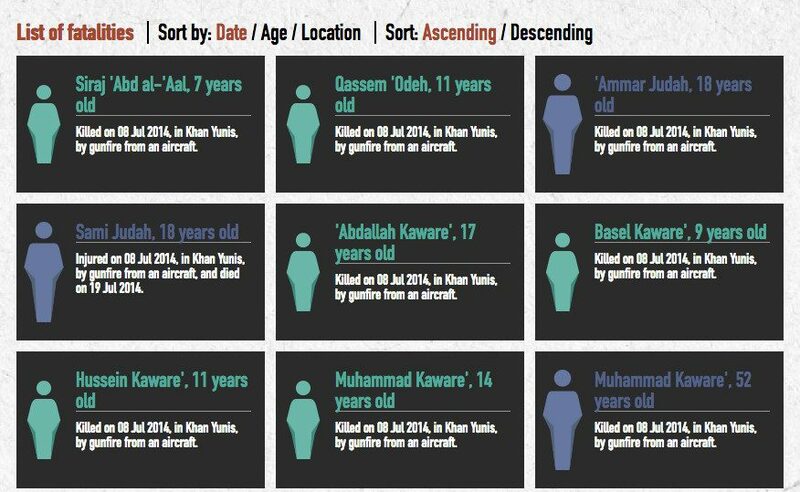 Detail from a page listing fatalities of the 2014 Gaza conflict, from www.btselem.org. These topics cover the main areas of activity – both in terms of processes and impacts – affecting casualty recording and its beneficiaries. They provide the basis for recognition and assessment of practice as currently carried out, and for aspirations, planning and improvements to future work. The production and publication of these Standards, however well suited they are to the needs of this field, is not enough. Continued, collaborative effort will be needed to ensure that rather than simply taking up shelf-space, the Standards begin to enter into and occupy the discourse and practice relating to knowledge of casualties and how that knowledge may be better obtained. It is only when they become an instrument in widespread use for the assessment of casualty recording, and a commonly referenced blueprint for its improvement, that the Standards’ full potential will be realized. Their positive impact will begin to be felt when practitioner organizations adopt them (in whole or in part, as their capacities and contexts allow), and when states, UN agencies, analysts and commentators make reference to them in such deliberations as resource allocation, or when assessing the significance and reliability of individual recording efforts. No field of practice can gain maturity and wider purchase unless standards are developed, agreed, and adhered to. The launch of these standards marks a very important moment for casualty recording as a field moving towards greater professionalization and public recognition. Of course, casualty recorders, too, yearn for a day when their work will no longer be needed. It might even be possible that, by credibly and meticulously highlighting the effects of conflict, their work helps bring such a day closer. But for as long as it remains necessary, it is vital that casualty recording not only continue, but improve, be understood, and adhere ever more closely to standards that best allow it to support the highest humanitarian ideals. Hamit Dardagan and John Sloboda are the co-directors of Every Casualty Worldwide, which hosts the Casualty Recorders Network (CRN), and with whom it developed the Standards for Casualty Recording. They are also co-founders of Iraq Body Count, a CRN member that maintains the world’s largest public database of violent civilian deaths in Iraq since the 2003 invasion, as well as separate running total which includes combatants. The Standards for Casualty Recording will be available in hard copy by request to standards@everycasualty.org, and as a PDF download from http://ref.ec/standards-v1 after the launch). Register now for the launch event to be held at the ICRC’s Humanitarium in Geneva, at 17:00 on Wednesday 23rd November 2016. Casualty Recorders Network Activities – Web portal. Developing Standards for Casualty Recording (.pdf) – Every Casualty report, January 2016. Elizabeth Minor, “Towards the recording of every casualty: analysis and policy recommendations from a study of 40 casualty recorders” (.pdf), Oxford Research Group, October 2012. Raphaël Dallaire Ferland, “Clarifying the fate of missing persons”, Humanitarian Law & Policy, 15 September 2016. Missing persons – ICRC web portal. The Global Protection Cluster is pleased to be able to support this initiative. Protection Clusters work around the world in situations where casualty counting is an important part of understanding the context and responding appropriately. Behind each casualty we must bear in mind that there is a story and loved ones left behind. Casualty counting is not the whole story but is sometimes a beginning, wakening the world to a problem. It is important work, to be done right.